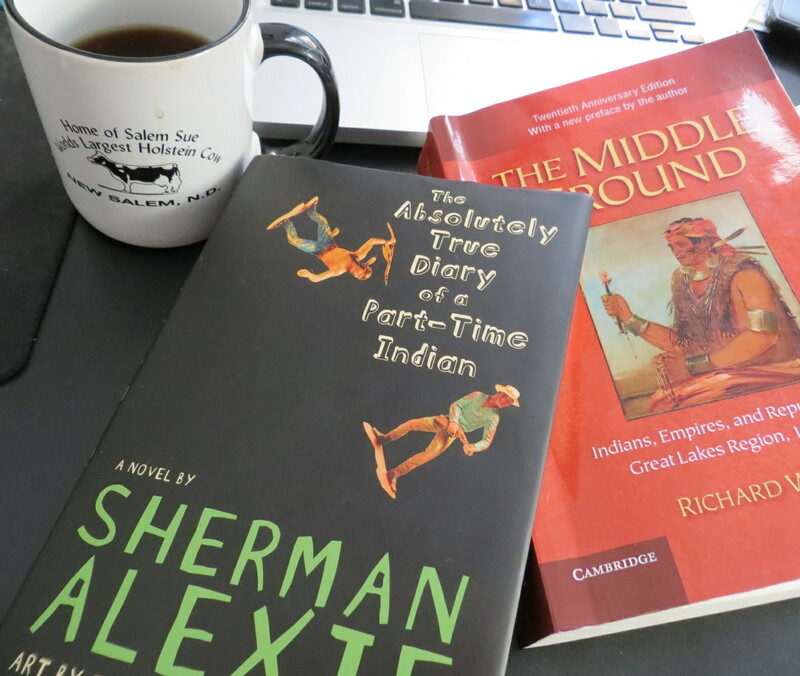 Earlier this morning I just finished Sherman Alexie’s novel, The Absolutely True Diary of a Part-Time Indian (Little, Brown & Company, 2007). It is excellent, and it pushed my mind in a variety of directions. This is what a novel is supposed to do, of course: an exploration of ideas through fictional narrative. The phrase “That’s a novel idea” smacks of this definition. Novels are real handy, too, since they operate under a kind of “fictional” rubric, giving the author lee-way to subjectively discuss real life issues and ideas. Because it’s fiction, though, it isn’t true — but it is. This is why the fiction section is arguably more truthful than the non-fiction section (which too is truthful, but with more distance). So I thought about that while reading the work. I also thought about how this novel was originally passed along from Karis Thompson to Molly, my girlfriend, and then to me. The novel, on the local scene, is slowly crawling northward through downtown Fargo, North Dakota. It is leaving a trail of ideas in its wake. A bunch of us will have to get together to chat about what this novel means to all of us. This brings up the point that there is no such thing as purity in culture. The question or thought is a fallacy from the beginning. And this also means that since there is no such thing as cultural purity, then there is no such thing as cultural death, or a culture that is dead. Alexie demonstrates this through his novel, about a Spokane reservation kid perceiving of himself as living in two worlds: the Native reservation world, and the non-Native reservation world. It also gives rise to the idea about how much emphasis we humans put on geopolitical boundaries. When we cross the boundary, say, between northeast Italy and southern Austria, we’ll note that people don’t suddenly stop speaking Italian after we cross south-to-north into Austria. What we do note is that while the line is distinct on a map, it isn’t so clear on the ground and in reality. So those are my short thoughts on Alexie’s novel today. And I wanted to share that and get it down on this here blog. Back to technical writing and revising. This entry was posted on Tuesday, January 7th, 2014 at 9:56 am	and tagged with Fargo, Middle Ground, Native America, North Dakota, Richard White, Sherman Alexie, Spokane, The Absolutely True Diary of a Part-Time Indian and posted in Uncategorized. You can follow any responses to this entry through the RSS 2.0 feed.